Situated in the Canadian Shield, on the shore of the St. Mary’s River and Rapids that separates Whitefish Bay and Lake Superior from Lake Huron, the locale that encompasses the city of Sault Ste. Marie has always played a role in the history of Canada, whether it be fur trade, western exploration, mining or forestry. Two cities share the name “Sault Ste Marie” - one in Ontario and the other side in Michigan. Eighty thousand people call these two vibrant sister communities home. The cities are separated by the river, rapids and locks. It’s interesting to note that the U.S. Army Corp of Engineers controls water levels in the lower Great Lakes by a series of dams at the head of the rapids. Sault Ste. Marie, Ontario, known affectionately as “the Sault”, anchors the eastern end of the Transcanada Highway Lake Superior Route, that follows the shore through a vast and beautiful area of wilderness known simply as “North of Superior”. Many people choose to drive the route in a westerly direction, from the Sault to Thunder Bay. To do this, involves getting to the Sault either by driving west from Sudbury and Manitoulin Island, or by crossing the border between the U.S. and Canada. Interstate #75 ends at Sault Ste Marie, Michigan. Transcanada Highway #17 begins on the Canadian side and divides to go north along the shore of Lake Superior or south along the north shore of Lake Huron. When approaching the Sault from Sudbury, through Algoma country, the landscape changes from rock and forest to a narrow band of farm land, known as the Canadian Shield’s north shore clay belt. Although some of the farms are well kept, there are many abandoned especially those closer to Blind River and Iron Bridge. When thinking of northern Ontario, rocks immediately come to mind. 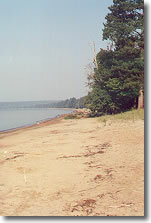 One surprising feature of the landscape is the large amount of sand on the north shore of Lake Superior, including attractions such as the Thessalon Dunes. Set aside several days to explore Sault Ste Marie, one day to visit its museums and galleries, and a second to take the Algoma Central Railway to Agawa Canyon. The city is easy to navigate. Many of the attractions are on the waterfront. Signage is good but you should be aware of one-way streets. A number of streets in the older section, off Highway 17B, are lined with lovely c1910 through 1940 homes, attesting to the fact that the area had some very wealthy citizens, most involved with steel, lumbering and mining industries. Areas in the city’s downtown core have been restored and a great deal of new waterfront development has taken place. As bushplanes played an important role in opening the northern wilderness, the best place to begin an area tour is the Canadian Bushplane Heritage Centre, voted one of the best indoor attractions in Ontario. Dedicated to showing the role of “pontooners” in opening the north, and fighting forest fires, the museum is housed in a c1960's aircraft hanger on the waterfront. Its permanent collection includes an excellent representation of bush planes including a deHavilland Beaver, CHC 3 Otter, a Noorduyn Norseman, Fairchild Husky and Grumman Tracker. Visitors love the interactive displays, radio room, fire tower and recovered remains of several significant downed aircraft. To fully understand the importance of bushplanes in northern Ontario history, be sure to see a twenty-minute media presentation before entering the museum. The Ermatinger-Clergue Heritage site is located directly across the road from the Bushplane Museum. The c1814 home of Charles Oakes Ermatinger, his Ojibway wife Charlotte and their thirteen children, is the oldest stone building west of Toronto. A self-guided tour gives lots of time to explore and ask questions of costumed staff. Clergue Block House is the second oldest stone structure in northern Ontario. Other city attractions include the Art Gallery of Algoma, Sault Ste Marie Museum and Museum ship, Norgoma, all in close proximity. A tour boat is the only way to fully understand the importance of the lock system, which bypasses the rapids and allows ocean-going vessels to move between Lake Superior to Lake Huron then on to the Atlantic Ocean. Lock Tours Canada Boat Cruise is located on the waterfront walk in Roberta Bondar Park with its many large wood sculptures and memorials. As the boat goes upriver through an old lock on the Canadian side and back down-river through one of the American locks, a running commentary is given. Interesting bits of information are garnered along the way. The St. Mary’s River is seventy miles long, with forty-two miles of that below the rapids; the word “Sault” means “Rapid”. When your cruise boat is lifted twenty-one feet to the upper river, a number of excellent heritage limestone structures that were part of the original canal complex come into full view. Many communities try to hide their heavy industry, thinking it wouldn’t be good for tourism but Sault Ste Marie is proud of Algoma Steel and the better for it. 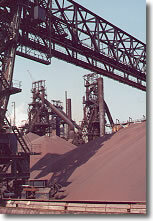 The boat tour includes a comprehensive close-up of the external operations of Algoma Steel. What a fascinating place to see with its piles of local limestone and ferrous oxide ore, smoke stacks, gas burn-off towers and a ship’s graveyard. The mill is the area’s largest employer with 3,500 people on its payroll. Algoma Central Railway runs an excursion train to Agawa Canyon from their centrally located station on the waterfront. As these tours are popular, especially those run during autumn foliage time, book well in advance. The excursion, to and from the Canyon, takes the better part of a day - the train leaves at 8:00 a.m. and arrives back in the Sault around 5:00 p.m. Those in the know say that it’s better to take the ride in late June or early September because sometimes autumn mists obscure the view. Be aware that black flies are a nuisance early in the season. An informative booklet is given out on-board the train that explains what one can expect to see enroute. The train passes through atypical northern scenery. Black spruce, regal and slender, are like sentinels stand at attention, wearing bonnets of pine cones. Other forest giants are so big, three men holding hands couldn’t span their girth. The tracks pass pristine lakes, wilderness cottages, bogs and muskeg - amazing areas full of water lilies and wild flag, stretching into the distance, always ringed by spruce. The train crosses rivers such as the Achigan, Goulais, Chippewa, Batchawana and the Montreal with its impressive trestle and falls. Several of the most interesting sights along the way are the incredible views over Lake Superior from the heights and massive walls in the Agawa Canyon territory. When you arrive at the canyon’s bottom, it’s hard to comprehend the full grandeur of rock walls rising from the Superior plain. You do have a choice of trails in the canyon but don’t choose anything too strenuous or long. The train waits for no stragglers! When its whistle blows, you’d better be on it. Better to spend your time looking at the on-site artifacts and memorabilia displays or taking a walk on one of the easy river-side trails. Remember the warning about that whistle! You can have a sit-down meal in the dining car or buy a box lunch - sold on the train - to enjoy at one of the many picnic tables in the canyon. A hint. Sit on the left side of the train going north into the canyon. Bring a good book to read on the way back to the Sault. When you leave Sault Ste Marie, on Great Northern Road/Transcanada #17, heading north toward Wawa, you must first drive through acres of the sort of strip and mall that haunt the fringes of every North American city. Be sure to gas-up along this strip before taking to the open road. Buy the making of a picnic lunch too. There aren’t many amenities - accommodations, gas, restaurants - between the Sault and Wawa. After crossing the inland Hayden area, the route follows the coast of Superior, staying close to Batchewana Bay with its striking views of the lake. Great picture taking here! Near Pancake Bay, be sure to stop at Agawa Indian Crafts & Canadian Carver stores where more than 200 Canadian carvers are represented. If you forgot to gas-up around Sault Ste Marie, do so here and stock up on snacks. Take your time driving this portion of the route. Stops should be made at Sawpit Bay to check out the cobblestone beach, at Mamainse Harbour for some great photographs and at Mica Bay to search for agates. Look closely for fingers of ancient lava flow along the shore. There are excellent sand beaches interspersed with magnificent soaring rock headlands, interesting road-side sand dunes and rock formations. If rocks are a passion, bring along a small hammer to gather samples. Rock outcrops include pink, grey and black granite with ribbons of white quartz and red haematite. Sand banks along the highway range from sparkling white through deep red. For the unschooled in geology, there are a number of publications you can purchase that explain rock formations and content along Highway #17 and throughout the Canadian Shield. Be sure to stop at the Agawa Pictographs, located in Lake Superior Provincial Park, an area that stretches from just north of Montreal Harbour to just south of Wawa. Be aware that the trail to the pictographs is steep and rugged. The hike is worth the effort, but not particularly to see the pictographs, which are on a rock face in a treacherous location, dangerous to approach from both land or lake. The climb down to the pictograph area is over slippery rock. It should be attempted but by only the heartiest, most agile and some might say, foolish individuals. Pictographs are subtle that picture taking isn’t an option and you sure can’t step back for better focus! You should do the hike just to see the headlands and rock falls that make a surreal and fascinating landscape, especially when combined with shore views and wind-blown pines. Near the lake, a plaque has been erected, dedicated to Selwyn Dewdney, a pioneer of pictograph research, who between 1958 and 1976, recorded more than three hundred sites throughout the Canadian Shield. Along the highway, valleys of glacial till, sand and gravel, interspersed with quiet lakes and extensive bogs, lie between ancient rock mountains. 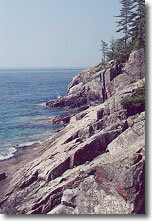 North of the Agawa Pictographs, rocks at Katharine’s Cove glisten with mica. At Old Woman Bay, headlands soar more than four hundred feet above the lake and have recently become home to peregrine falcons, thought to be extinct in the area. 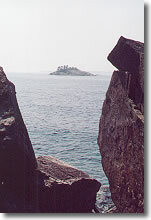 The town of Wawa sits on a plain above the valley of the Magpie River that spills into Michipicoten Bay, “Michipicoten” being an Indian word meaning “Big Bluffs there”. Scenery is spectacular. Huge rock hills, crowned with soaring pines, rise from valleys noted for their gravel and sand deposits. Although there has been a European presence in the Wawa area since the 1620's, the town’s history began in earnest in 1897 with the discovery of gold, followed closely by that of iron ore and more recently diamonds. Of course, the area has always been known for its pulp log industry. The community is best marked today by its large, free-standing, metal sculpture of a Canada Goose, “Wawa” an Indian word for Canada Goose. 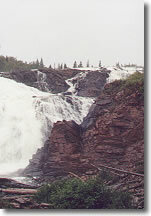 As Magpie River flows from the heights, it passes over a number of gorgeous waterfalls - Mission, Silver and High Falls being three of the better known. A wooden bridge that crosses the river just below Silver Falls leads past historic Michipicoten River and MacKenzie- Bethume Cemeteries. High Falls is the most spectacular with its seventy foot drop and gorge that slices at an angle from the base of the falls. Adventurous? Ask at the Information Centre for directions to the site of the old Hudson’s Bay Trading Post that closed in 1904, Driftwood Beach, the remains of Old Fort Friendship, the ruins of an old hydro plant on the Magpie River and Eagle’s Nest, the former home of Sir James Dunn. Consider a driving tour through the Wawa badlands, an area made desolate by the emissions from a sintering process that laid bare the very bones of the Canada’s northern shield. Although in rejuvenation phase, there are still acres of blueberry flats, rare geological formations, cobble fields, ancient rock terraces and an abandoned open pit iron mine with fascinating rock faces, to explore. Rare sandhill cranes call the area home. You need a good map for this venture into the badlands. If you do get lost, just ask directions from any of the many blueberry pickers. If you’re not familiar with things geological, enquire about guided tours through this area before you arrive in Wawa. Believe me folks, this is as close to seeing the surface of the moon you’ll ever get. 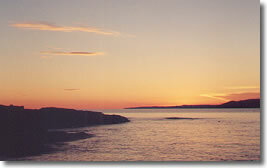 Lake Superior and Michipicoten Bay are known for their spectacular sunsets. One of the best places to enjoy the evening spectacle is from Naturally Superior Adventures property. While there ask about the company’s guided day tours, canoeing, sea kayaking instruction and tours, self guided Eco-tours, weekend getaways and eco-seminars. Sea kayaking is the fastest growing sport adventure on the north shore of Superior. Naturally Superior Adventures is the company to plan an exciting get-away for you. While in the Wawa area, check out Vintage Warehouse a treasure trove of vintage clothing and household items; and Young’s General Store, an eclectic mix of things old, new, sweet, sour, small, large and live. Watch for squirrels and chipmunks who help themselves to nuts that are kept in a bag outside the front door of the store - just for them. As a full-service community, Wawa has a number of restaurants and accommodations. 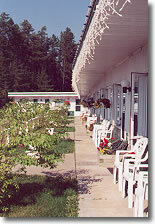 One of the nicest is the Mystic Isle Motel on Highway #17, just a little south of the community. Its fourteen rooms are tastefully decorated and the grounds are planted with flowers, in plots, pots and planters. Meals at the Cedarhof, right next door to the Mystic are excellent, huge and in both the German and Canadian tradition. Other good places to eat are the Viking Restaurant in downtown Wawa, the Kinniwabi Pines on Highway #17 across from the Mystic Isle Motel, and the restaurant at Wawa Motor Inn. The ancient rock shield of the Canadian North has its own incredible charm that will lure you back again and again to enjoy its miles of pristine wilderness, rugged ancient mountains, fast flowing rivers, crystal clear lakes and abundant wildlife. If you love the outdoors and want to experience nature at its best, you can’t beat North of Superior in Ontario. Every Canadian should experience the true north - strong, free and absolutely gorgeous. As with any trip, be sure to write for a comprehensive package of information before you leave home. During busy seasons, make reservations in advance. Be prepared for logging a lot of miles between communities. Northern Ontario is not heavily populated. Most amenities and necessities are located in larger centres.